The Hartwood 8′ x 6′ FSC Pressure Treated Windowless Overlap Apex Shed is one very classic looking kind of shed that does not mess around. It is not here to make any kind of fashion statement, even though it does have a good look, it is here to give you one very solid and long lasting structure to keep a whole bunch of items safe and organised. This shed is a very good size and gives you plenty of storage space to make use of. Its windowless design makes it perfect for those of you who crave a little privacy or who just want to make sure none of your items are on display. 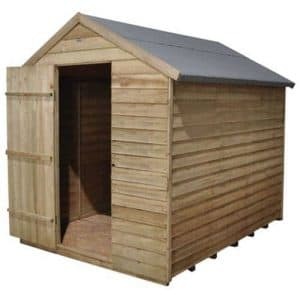 This is a shed which is built to last and that is evident with its strong and well made, 8 mm thick overlap cladding which you are going to just love. 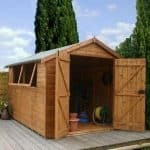 Not only this, but a robust frame is right behind the cladding that really does make this one sturdy shed which is going to give you many years of service. The floor and the roof are both made with solid sheet boarding which makes them strong. These are further protected by the roof having a covering of heavy duty mineral felt and the floor being supported with floor joists. The Hartwood 8′ x 6′ FSC Pressure Treated Windowless Overlap Apex Shed is a good mid sized shed that due to the way they have rough cut the wood has a very rustic charm. We really love the design that they have given this shed as it really does catch your eye. It is also a very decent size, giving you plenty of space to keep your belongings safe out of the rain and out of the sight of thieves. At 6 feet 9 inches wide and 7 feet 11 inches deep, you have a lot of floor space to make use of in this shed. This kind of space should allow you to store things in an organised manner rather than then all piled up on top of each other. The height is very impressive as along the ridge of the roof there is an incredible 7 feet of headroom, even the eaves height is respectable at 5 feet. The roof is something that at first looks like any other ordinary apex roof, but when you take a closer look you can see that they have not just used cheap felt to cover the solid sheet boarding. Instead they have used some strong, heavy duty mineral felt this means that the roof can take quite a bit of weight from the snow and also from your neighbor’s annoying cat that seems to think it can strut across your roof. The shed gets its rustic charm from the gorgeous 8 mm thick overlap cladding that they have used. We know it may not have the smooth look of shiplap cladding, but there is just something so cool about the way that this looks. Of course if the cladding is going to be weak and let in water then really, who cares what it looks like? But thankfully this cladding is strong and also put together so well that the rain will never get inside. A 28 mm x 28 mm frame is used inside the shed and this is something that we are happy to see. 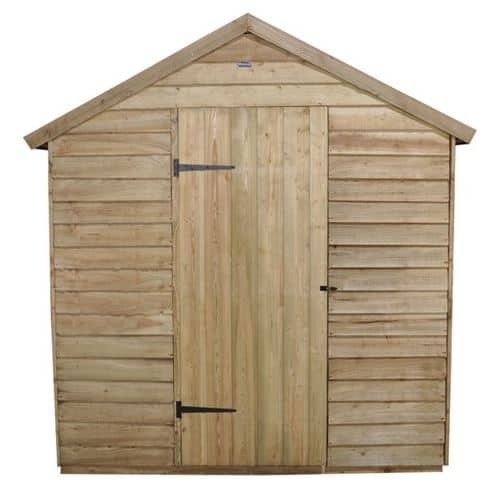 As this is a shed that is a good size, you want a solid frame to keep it all together. The frame is strong, but you do not have to worry about it taking up valuable real estate in your shed by sticking out too far. Under your feet is some solid sheet boarding and this is more than strong enough to handle the weight of a whole lot of items and you pottering around inside as well. This flooring is not on its own either, it is helped by some strong floor joists that will keep the shed from sitting directly on the ground. 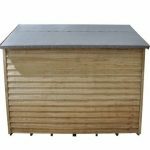 The pressure treated wood is just fantastic and it means that you will not have to get the brush out and treat this as often as you would a non pressure treated shed. Still a coating of wood treatment at some point is something that we would not be against. 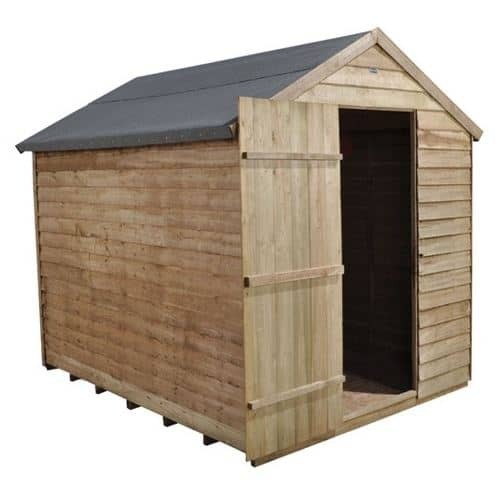 A ten year anti rot guarantee is included with the Hartwood 8′ x 6′ FSC Pressure Treated Windowless Overlap Apex Shed as long as you look after it properly and give it a regular coating of treatment. We really like the way the door looks. They have gone for vertical cladding on the door and it makes it look like an old style shed you would find deep in the woods. The door is complimented and prevented by sagging with two high quality hinges. A hasp and staple is used to close the door which is fine, but it will not lock the door. Overall the door is well made and with the three braces on the back of it is a rather robust door that can take the odd slam. 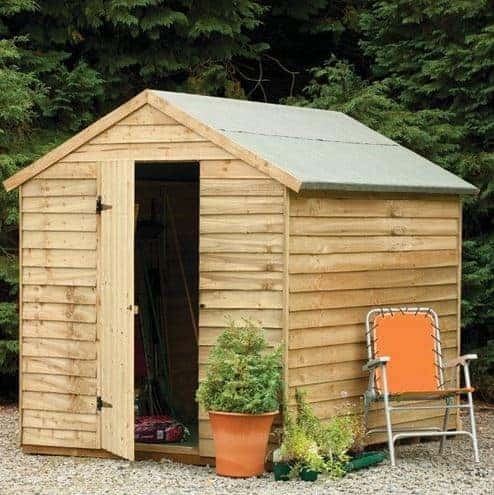 No windows are included with this shed to help keep your items safe. While we like to see windows on a shed, we must admit that the fully boarded look of this one is very nice to see. The hasp and staple makes adding something like a padlock very easy so you can make it so you can lock the shed door. This is worth doing if you have expensive tools or other such items inside the shed. The windowless design of the shed means that you have a very private shed on your hands here. This makes it perfect to hide your items away from thieves and also for you to hide from your other half when you have done something to get yourself in trouble. While we love the rustic look of the shed, we know that some of you may want to change the look a little bit with a coating of paint. 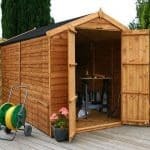 If though you are like us and like the way the shed looks on its own then use a wood treatment that will just lighten or darken the shed. If the idea of a padlock from the pound shop is not something you are too keen on then they do offer a higher quality Yale branded hasp and padlock set that will keep the door locked for a price of £19.99. They also have this awesome alarm security kit that will really make any potential thieves think twice. This costs £29.99, which we feel is not too high a price. 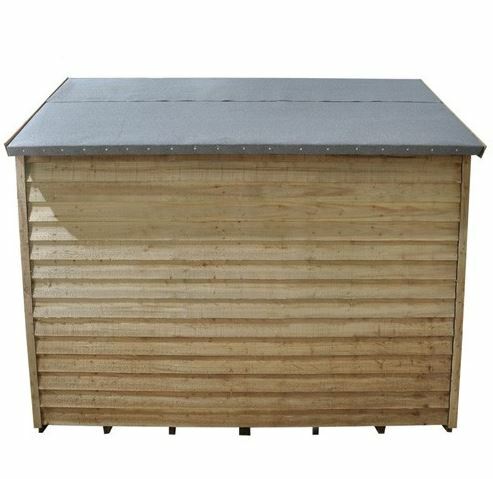 They do offer a plastic shed base which can be used if you do not want to place the shed directly on the ground, this is a little pricey though at £119.99. We are impressed with the quality of this shed. Even though it is a little larger than some of their other sheds, they have not cut any corners. That cladding and frame have been selected because they are able to last for many years. 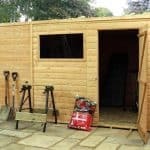 The whole shed actually is something that is going to stay strong for many years and with a little help from you, it is going to stay free from rot and keep looking great as well. We feel that 8 X 6 really is a good size for a shed as it gives you plenty of storage space, but at the same time it is not overly large which is something we really like. 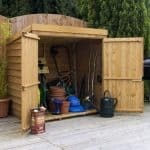 Even those of you who would normally shy away from DIY should have no major issues installing this shed. It may be a little on the large size, but with the help of a friend, we are sure you will have this up and ready for use in 4-6 hours. We feel the price they are asking for this shed is very fair and even though it is larger than some of their other sheds they have not raised the price considerably. 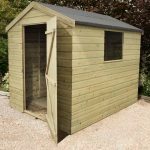 Final Thoughts: If you are looking for a good, solid and reliable shed then the Hartwood 8' x 6' FSC Pressure Treated Windowless Overlap Apex Shed has to be one that makes your shortlist. This is one very well made shed that has a very classic kind of style to it which is something you do not see a whole lot. 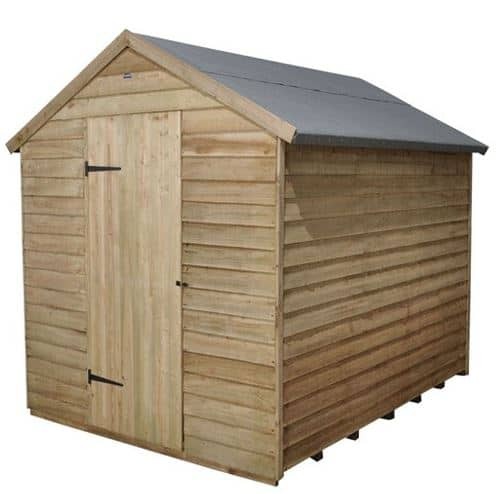 While we like the looks it is the size, longevity and overall robustness that makes this such a good shed and one that is very easy to recommend. 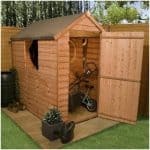 For those of you who want a shed that has been designed with keeping your belongings safe first and foremost then this is the shed for you.